The Year Was . . .
"The time has come," the Walrus said, "to talk of many things." many things, and nothing in particular. Let me introduce you to Historypin. Historypin is sort of a digital time machine that allows you to view and share your personal history in a very unique way. Historypin asks you to dig out, upload and pin your old photos, as well as the stories behind them, onto the Historypin map. It lets you layer old images onto modern Street View scenes, giving a series of peeks into the past. Historypin uses Google Maps and Street View technology to accomplish this. They hope to become the largest user-generated archive of the world's historical images and stories. Oh, how I hope they can do it. But they can't do it without us, so if you pin a photo and tell a story please leave a comment or send a note to the footnoteMaven@comcast.net, so I can compile a list of our efforts. Here is a short video describing the project. There are some changes going on behind the scenes at Shades Of The Departed, The Digital Magazine. The June and July issues are being combined into one themed issue, The Wedding Issue, which will be published this week. An issue of Shades will be published monthly through December 2010; they will also be themed rather than a particular month. 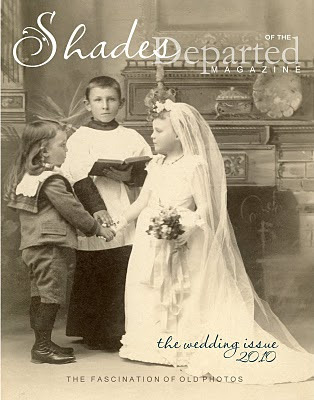 Beginning in January/February 2011, Shades will be published six times per year, also with a theme for each issue. We will be looking at the photographs of the old west, back to school, momento mori, toys, politics, your immigrant ancestors and more. It takes a great deal of work to produce the magazine and it is accomplished with love rather than money. (OK, so my husband doesn't really buy this one. He says money goes out but never comes in.) In an effort to lighten the burden on all the contributors we are making this change in the production schedule. Shades will also be adding some specialized publications to the mix that we hope will be of benefit to our readers as photographic resources. There are some doozies here. You may or may not know that this year has been a challenge for me with some nagging health issues. I would like to thank you for your patience during the rough spots. Personally, I love Shades and will do everything in my power to "keep on keepin' on." See you this week at the wedding! I am a Business Card Nerd, but you knew that didn't you? 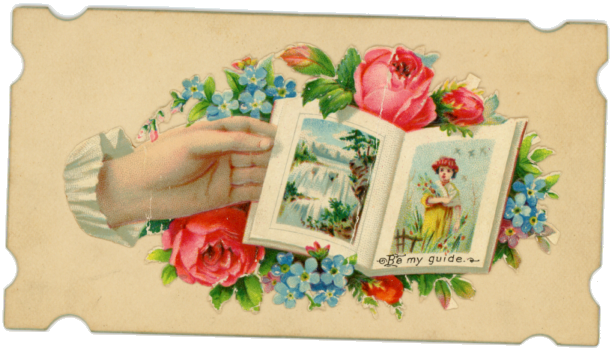 I'm certain that had I been born in Victorian times I would have had a beautiful calling card and collected those little treasures in albums created especially for them. Today, I create my own Business Cards and admire those of others. When you're a collector you are always pleased to meet, in this case, another Business Card Nerd. 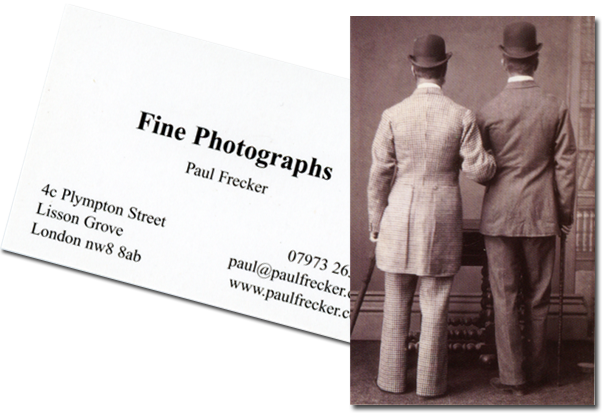 I bought a photograph from this Fine Photograph seller and was thrilled with his unique business card included in my purchase. 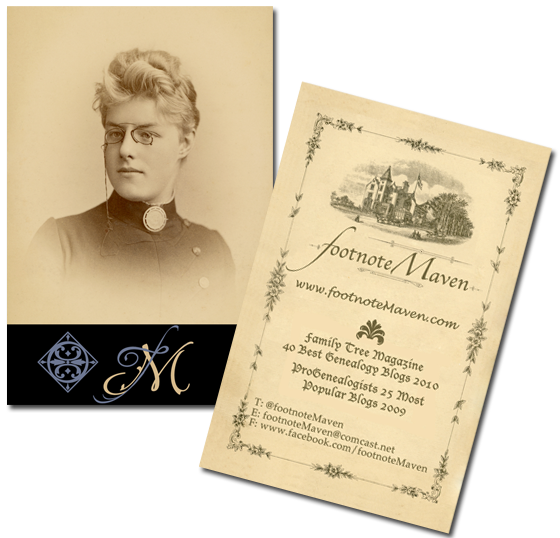 So, as you travel the world and the web, look for inspiration in designing your business cards. And make sure to read the November issue of Shades Of The Departed, The Magazine, for a feature article on calling cards. This is going to be a keeper. Moo.com - You know I love them, check them out for inspiration. CardNerd - Yes, we have our own website. 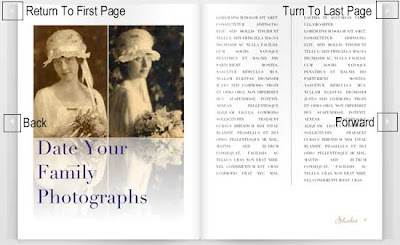 Smashing Magazine - Here are the inspiration and tutorials of Smashing Magazine. eBay - Search eBay for Victorian calling cards and business cards. You don't have to buy to be inspired. 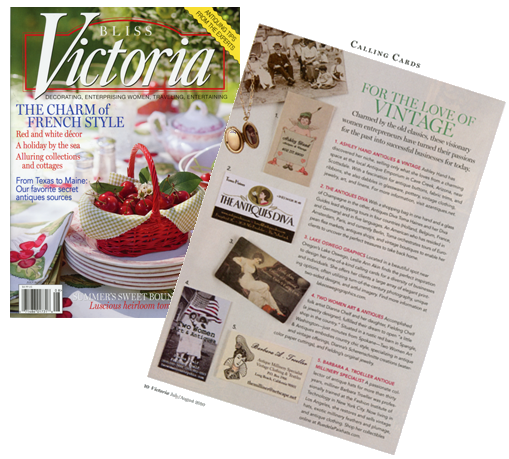 Victoria Magazine - In the real world Victoria Magazine devotes a page to beautiful modern day Calling Cards. There's a tremendous amount of inspiration here, and I have every issue. from old photography books, magazines, and newspapers. In doing research into an old tintype containing some interesting men's clothing, I came across the following article and could not resist. THE DIRT ON CLEAN. "The First Steps That Count"
The use of perfumes unwise. There is more reason in the Englishman's morning " tub" than most people give him credit for. It is not mere affectation. A nice Anglo-Saxon in England or America understands that cleanliness is the prime requisite of health and of a gentleman, and that for obvious reasons a man who does not indulge in frequent baths will not be an acceptable person in good society. It is no little trouble to keep clean, but it pays, and is the basis of all decency. There are various ways of doing it, some more convenient than others. A tub-bath in one's own room is an awkward arrangement, and a sponge-bath scatters too much water; while to fill the stationary tub takes time and watching. Most convenient of all is the shower-bath. If this is arranged for hot and cold water, it requires only a moment's patience to get a shower of the proper temperature, and not much longer to take a good bath and a thorough wash with castile soap. Not every one can stand the shower well, and delicate men should be careful not to take it too cold or too often; but the average man may enjoy a bath of this kind every morning without harm to his health. One should wipe himself thoroughly until perfectly dry. It is not necessary to have a towel as rough as a corn-cob, nor to keep up the rubbing till the skin is blood-red, as many books about health insist. While the tepid bath is agreeable and harmless, the bather should constantly try to lower the temperature, provided it does not get so cold as to leave him in a chill. After a bath the operation of shaving is in order. Every man ought to shave himself. So doing not only saves money and time, but it is cleaner. 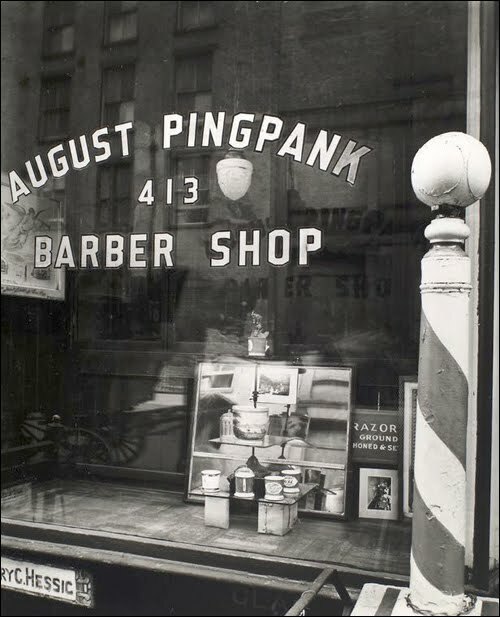 It is not agreeable to a person of refinement to have a barber pawing his face; neither does a gentleman enjoy the society of the barber-shop while " waiting his turn." The haughty man who would not allow the barber to turn aside his long Roman nose (although it was gently done), nor to pull down the corners of his mouth, did not deserve the credit he claimed for not tolerating familiarities from any one. He should have shaved himself at home, and manipulated his own features. The care of razors may be a little difficult at first, but the knack of sharpening them is easily learned, and, aside from the advantage of cleanliness, if one has a tender skin, he can shave himself more easily than any one else can do it for him. Of course, for trimming the beard—the chin-whisker is not tolerated now—the mustache, and the hair, it is necessary to endure a barber; but under no circumstances should he be allowed to put anything on the hair except cold water. Nothing is so objectionable as the smell of cheap perfumery. A word here as to perfumery in general. Don't use it. It was formerly employed, according to some authorities, by people who did not take baths, to disguise that omission; and, from this point of view, the use of it to-day is a suspicious circumstance. In combing one's hair, which comes along about this time in the order of dressing, the principal point to be considered is where to part it. There is little doubt that it ought to be parted in the middle. So doing adds to the symmetry of the face, and it is almost the invariable practice in all countries, the United States excepted. In the noted public art-galleries of Europe one rarely or never sees an antique statue with its chiseled hair parted on the side. The line of division is in the middle where there is any line at all. Candor compels the admission that in many cases there is no parting; the front locks fall over the forehead in an easy, graceful, and natural way, as much like the modern " bang" as possible, except that the hair is not trimmed off evenly. This is especially noticeable in the statues of Roman emperors which may be seen in the Louvre ; and the head of the young Augustus, so well known, has a decided bang. Yet there is nothing effeminate about these old statues. It is not intended here to say anything in defense of the bang, which, as it exists on a man in modern times, is a monstrous spectacle. It is merely desired to point out that, if precedent is needed for letting the hair divide naturally on the top of the head, it can easily be furnished. For many years in America to part one's hair down close by the ear was considered the proper thing; but the fashion of parting it in the middle is sensibly beginning to prevail, and after a short trial one will soon become convinced that a part in the middle is vastly more becoming than a part on either side. Of course, if the hair is thin on top, this fact may be disguised a little by a parting on the side. If you object to a dividing-line on top because it is not seen there on most of the men you know, make the parting at least as high as you can stand it. It is the fashion now, and probably will be for a long time, to have the hair cut rather close at the back and on the sides. It is not parted behind, as was once done. The growth on the neck should never be shaved, but merely clipped close with the scissors. If the hair is left a little long on top, it parts more easily. A closely cropped head is too suggestive of the prize-ring to be advised. It is permissible sometimes to put a little cosmetique on each side of the parting, so that the hair will remain in place. Avoid frequent shampooing, as it tends to make the hair come out. The hair should be washed in cold water, without soap, during the morning bath. It is held by some that washing the head in a basin containing a few drops of ammonia in the water helps to keep the head free from dandruff. This may be so. At any rate, the hair must be kept so clean that there is never any dandruff on the coatcollar. It is well enough to comb the head once a week with a fine-tooth comb before washing it. It is not necessary to dwell upon the importance of cleaning the teeth. They should be brushed twice a week with toothpowder, and every day with soap and water. They should be carefully watched by a dentist in whom you have confidence. No money is ever better spent by a young man than that paid out for having his teeth properly attended to, and filled when needed. It is laying up a store of enjoyment for a later period in life, when eating is about the only pleasure left. The hands always need careful attention. They can only be kept clean around the nails by the frequent use of a nail-brush, soap, and hot water. Castile soap is the best to use; it leaves no odor, and does not chap the hands. If the soap furnished at the basin in the office is too cheap, keep a piece of a better quality for private use in your desk. The finger-nails in some countries are allowed to grow very long, and are cut to a point. Indeed, long, pointed nails were at one time supposed to indicate a gentleman, or at least a person who did not work, for if a man performs manual or clerical labor his nails are sure to be broken. In this country nearly every one works, and the claw-like fashion in trimming the fingernails does not prevail. But an American gentleman keeps his finger-nails cut pretty short (about even with the end of the flesh), with just a suspicion of a point. The callous bits of skin around the sides ought to be removed with sharp, curved nail-scissors, which can be bought at almost any cutlery-store. It isn't necessary in America to show by the hands that one does no work. It is simply required of a gentleman that his hands shall show proper care. A New York Clubman. Hints About Men's Dress. D. Appleton & Company. New York. 1888. Barber Pole. Inset. Abbott, Berenice. Print. 1935. Changing New York/Berenice Abbott. Miriam and Ira D. Wallach Division of Art, Prints and Photographs. NYPL Digital Library, New York.